A couple of weeks ago, Microsoft launched Silverlight. It had to be the opponent of Adobe Flash. I have to admit, I was really curious what this Silverlight could do, if you can really think you can just "bump off" Flash from their number 1 position on the net. 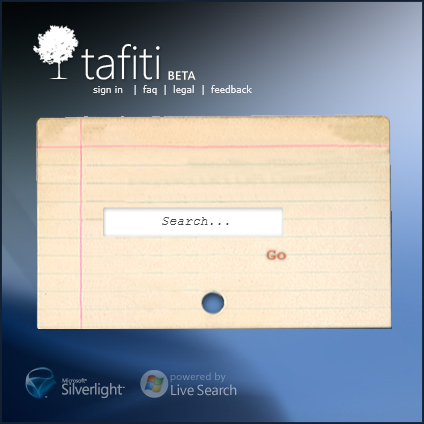 I tried Tafiti (Also from Microsoft) to test this new Silverlight. It's a Silverlight driven search engine. As expected, it really looks beautiful. But is it really that useful? I don't think so. As you can see when starting up Tafiti, the chosen colors are pretty easy for the eyes. Another thing that notices me, is that Tafiti uses Microsoft Live Search. Ok, there we go, I'm going to search for "Tafiti" in Tafiti self. Ok, it looks nice, but there are so many things in the screen and I really don't have any idea what the use of it is. 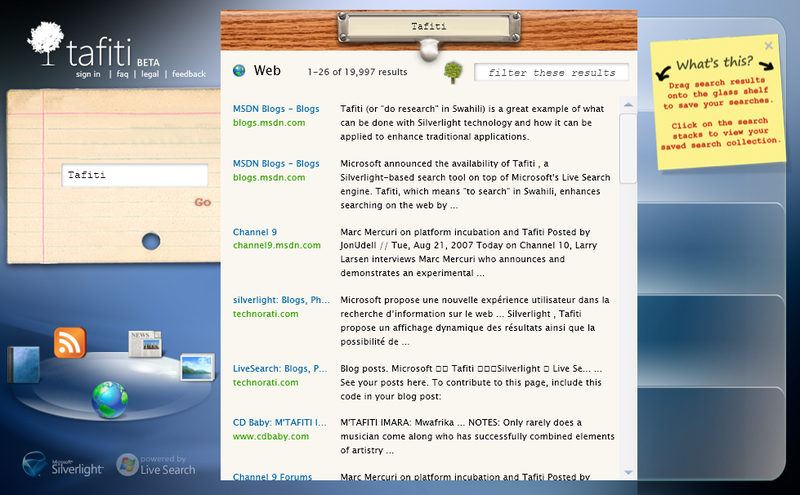 When I click on a search result, my webbrowser Firefox starts complaining that Tafiti wants to open a pop-up window. If there is just one rule when making websites, that should be that their should not be any pop-up windows. On the right you'll see some tabs that you can use to stick your search results to. Funny, yes. Looks nice, yes. Useful, no. Tabs were created in webbrowsers to do so, not to do it in the search engine themselves. The filter allows you to filter your searchquery and narrow it down to some specific search results. Now that is something I like and can be pretty useful. But there's something I don't like about these search results. When you scroll down (Wait a second, is it just me or doesn't my scrollwheel respond to the scrolling pane?) and you click "More..." you'd expect to see a next page of search results. But no, instead of that Tafiti just makes the list of search results longer and longer and longer and longer... That way you'll need a seperate search engine for your search results. What I especially like about Tafiti (Yes, there are actually some things that are nice), is the function to find RSS Feeds. Me, as a person who's interested in reading other persons articles really thinks it's a nice addition to a search engine to search feeds. 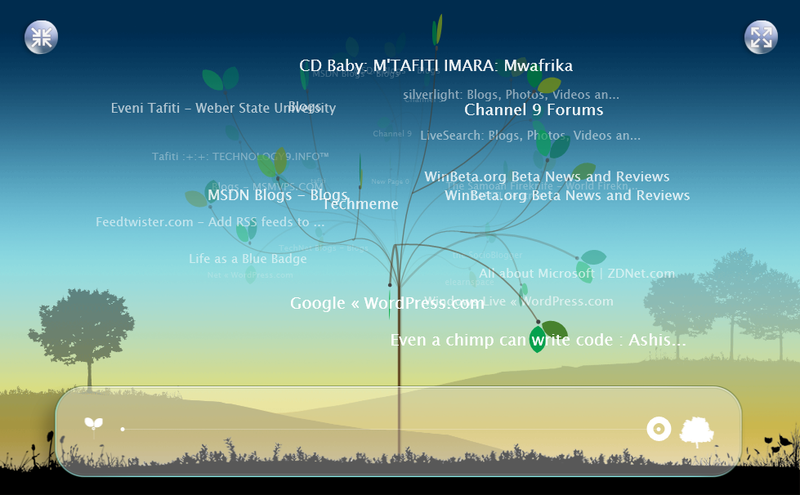 Aawh, how cute, they added a tree above the search results. Let's click on it. Once again; It looks nice, but it's not useful at all. This tree does remind me of the Tag Cloud introduced within Web 2.0 applications. I just want my search results, not a tree that is spinning around. Overall it's nice to see Silverlight working, but I don't think Tafiti will be a great success. The addition to e-mail and blog your searches will not have such a big impact, especially because you can only blog on MSN Spaces. If you search, you just want search results, nothing less, nothing more. You don't want it to take ages to load, which in fact happens on Tafiti. So, I'll be heading back to Google for my searches. C'mon Microsoft, please learn from your mistakes. Ms. Dewey wasn't such a great success and this isn't going to be any better. I wish you good luck with your next project or getting this in a nice alpha release. Maybe read a book on user experience or something.